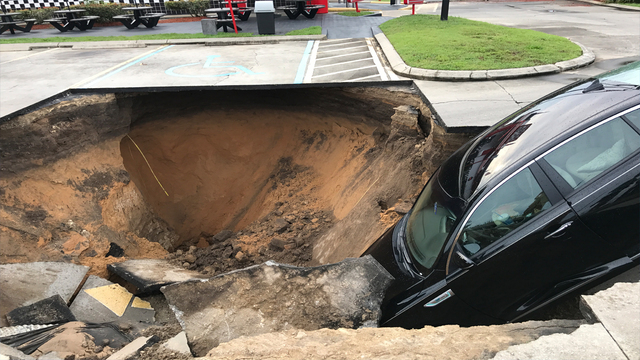 OCALA, Fla. - A man and woman somehow managed to escape their car after they realized a sinkhole opened in front of them in Ocala. The sinkhole opened near the intersection of Southwest 27th Avenue and State Road 200, also known as College Road, at the Gateway Plaza. Video shows a car teetering on the edge of the 25 foot by 25 foot hole in a Checker's restaurant parking lot. The sinkhole was likely caused by flooding from earlier in the day, according to officials. The sinkhole ruptured a gas line, causing some businesses to be temporarily evacuated. Ocala Fire Rescue personnel said State Road 200 was closed between Southwest 27th Avenue and Southwest 26th Street. The roadway has since reopened. Ashley Lopez of Ocala Fire Rescue said she does not believe the hole will expand any further. She said the car was removed from the hole Sunday morning, but did immediately provide information as to how the sinkhole will be covered. Lopez said traffic had not been impacted since State Road 200 reopened Saturday.